Favorite coffee memory: Having a cup of coffee every evening with my dad, when I was growing up. Elvira joined InterAmerican in 2015, as part of the Quality Control team. While new to the world of specialty coffee, a short three years later, she’s a licensed Q grader. A Texas native, she was raised in Houston and is fluent in Spanish. 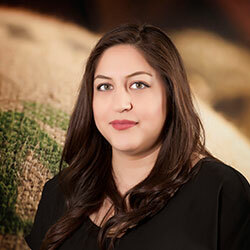 Her love for coffee has grown and led her into the trading side of the business. She’s as eager as ever for new experiences and to learn more about this amazing industry. Elvira loves spending time with her daughters and wonderful husband. In her free time, she likes to binge-watch movies and go shopping. Random fact: Because of my kids, I can be caught watching the Disney channel, even when they aren’t around! Favorite company outing or event: I must say, iFly indoor skydiving was very fun.